Composer/artist Jake Meginsky, a New Music USA award winner and Massachusetts Cultural Council Fellow, has collaborated and performed with an extraordinary range of musicians including Milford Graves, Alvin Lucier, Joan La Barbara, Vic Rawlings, Greg Kelley, Bhob Rainey, Joe McPhee, Thurston Moore, William Parker, Daniel Carter, Paul Flaherty, Arthur Brooks, and Bill Nace. His work has been presented widely and internationally, including the Click Festival (Copenhagen, Denmark), Standards (Milan, Italy), the Duolun Museum of Modern Art (Shanghai), Beijing Today Museum and Jinse Gallery (Chongqing, China); throughout New York City at The Kitchen, New York Live Arts, Joyce SoHo, Dance Theater Workshop, Danspace Project, Symphony Space, Judson Church, La MaMa, The Stone, The Flea Theater, Vision Festival, Roulette, Museum of Arts and Design, Center for Performance Research, Improvised and Otherwise Festival, and Free 103; in Boston, MA at Opensound Festival, The MIT Center for Art, Science & Technology, YDLMER Festival, Mobius Gallery, Le Laboratoire and the New England Complex Systems Institute; The Neurosciences Institute (La Jolla, CA), Context Art Fair (NYC & Miami), Experimental Music and Performing Arts Center (EMPAC) and the Arts Center for the Capital Region (Troy, NY), The Fisher Center for the Performing Arts (Bard College, NY), DOT AIR Festival (Providence, RI), University of Iowa, Flynn Center for the Performing Arts (Burlington, VT), Work in the Performance of Improvisation Festival and USDAN Gallery (Bennington College, VT), A.P.E. Gallery, Academy of Music, and the Sound and Space Festival (Northampton, MA), Pioneer Arts Center (Easthampton, MA), and the Mead Museum of Art (Amherst, MA). His work has also been supported by several organizations, including the Jerome Robbins Foundation, Bumper Foundation, National Performance Network, Vermont Arts Council, Massachusetts Cultural Council, Northampton Arts Council, Lower Manhattan Cultural Council and New York City Department of Cultural Affairs. Meginsky’s work has been reviewed extensively in leading contemporary music, art and culture publications worldwide. Huck Magazine (London) describes Meginsky’s work as “constantly transgressing the boundaries between acoustic and electronic, analog and digital.” David Keenan called Meginsky’s 2014 solo record, L’appel Du Vide, “a hallucinatory electro percussion masterpiece” and in the WIRE Magazine review of the LP, Nick Cain writes, “the album uses little more than a couple of sounds, extracting often head-spinning complexity from a minimum of means.” Art In America Magazine says, “Meginsky’s digital concrète takes percussion to outer extremes.” Secret Thirteen (Berlin) calls Meginsky “one of the most adventurous minds in experimental music today.” L’appel Du Vide was included in the WIRE’s 2014 Top 10 Records of the Year for Outer Limits. Meginsky's Seven Psychotropic Sinewave Palindromes was listed in FACT Magazine’s Top 50 Albums of 2016. Meginsky frequently collaborates with choreographers and has worked with Cori Olinghouse, Paul Matteson, Jennifer Nugent, Susan Sgorbati, Katie Martin, Wendy Woodson and Nora Chipaumire. He has a longstanding artistic relationship with Gwen Welliver. Welliver and Meginsky will premiere a new evening-length work at Gibney Dance Center (NYC) in 2018. Meginsky is the recipient of a New Music USA Live Music for Dance award for his original composition for Welliver’s Beasts and Plots, which premiered at New York Live Arts in 2013 and will be restaged at the Guggenheim in 2018. His recordings can be found on NNA (Burlington, VT), Mantile (London), Second Sleep (Milan), Feeding Tube Records (Northampton, MA), Rel Records (Providence, RI), Open Mouth Records (Northampton, MA), Wooden Finger Records (Belgium), Ultra Eczema Records (Belgium), and Ecstatic Peace Records (London/Northampton). He recently remixed Body/Head’s (Kim Gordon & Bill Nace) “Last Mistress” for Matador Records (NYC). His latest solo LP, Gates and Variations, was released on Open Mouth Records in October, 2017. Bill Nace is an artist and musician based in Philadelphia. He has collaborated with an extraordinary range of musicians, including Michael Morley, Mats Gustafsson, Joe McPhee, Chris Corsano, Jooklo Duo, Chris Cooper, John Truscinski, Thurston Moore, Jake Meginsky, Jessica Rylan, Paul Flaherty, Wally Shoup, and Kim Gordon, with whom he regularly plays as one half of the duo Body/Head. Their critically acclaimed LP “Coming Apart” was released on Matador last September. He has been a featured musician in festivals such as ATP (curated by Jim Jarmusch and held in Monticello, NY), Colour Out of Space(Brighton, UK), Supersonic Festival (Birmingham, UK), International Festival Musique Actuelle (Victoriaville, QC), and Homegrown (Boston, MA). He has performed in a wide variety of venues, running the gamut from the Musee d'Art Contemporain (Strasbourg, France) to The Stone (NYC) to Bennington College (Vermont). Nace’s range has been described as “ veering from sculptural, almost Remko-Scha-esque chime to Loren Connors-style elegance in only a few short moves.” (Mimaroglu Music, 2010). Recordings can be found on Ecstatic Peace (Northampton, MA) Ultra Eczema (Belgium), Holidays (Italy), 8mm (Italy), Throne Heap (VA), HP Cycle (Toronto, ON), as well as on Nace’s own label Open Mouth. Andrea Pensado began playing piano as a girl, with private instruction. She obtained her BA in Music Education from the University of La Plata in 1987. Immediately following, she moved to Poland where she continued her studies at the Krakow Academy of Music. Pensado graduated in Composition with honors in 1995. Her professors were Barbara Buczek and Boguslaw Schaeffer in composition and Marek Choloniewski in computer music. The music of that time shows a wide variety of interests, from pure instrumental to mixed genres such as instrumental theatre, live electronics and text sound compositions. During this period, she was invited to participate in numerous festivals and workshops, as a result, her music was programmed in Poland, Austria, Germany and Holland. In 1997, she moved back to Buenos Aires. In 1998, she cofounded an interdisciplinary duo (Qfwfq) along, with Gregory Kowalski (in charge of the images). While still in Buenos Aires, the duo often worked with the collaboration of solo performers (Martín Moore, Lucio Capece, Adriana de los Santos). They presented their work in many events in Buenos Aires, including the Cycle of Electronic and Experimental Music (in the Museum of Modern Art); the International Sound Art Festival EXPERIMENTA; the Cycle of Contemporary Music at the San Martin Theatre; the Experimental Video Festival (in the Museum of Fine Arts) and the Ricardo Rojas Arts Center. In 2002, Pensado moved to the USA. At first, she continued performing with Qfwfq, mainly in the Boston area. The duo channeled most of her artistic work from 1999 to 2009. Presently, Pensado performs extensively in the US, both as a solo artist and in frequent collaborations with other musicians. Her more stable groups at this moment are: PHURNNE (with Jenifer Gelineau and Stephanie Marie Germaine) and LOS CONDENADOS (with Walter Wright, Chris Strunk and Jules Vasylenko). She has also played with, among others: I’d M Thfft Able, Forbes Graham, Ben Miller, Luther Gray, Junko Fujiwara, T odd Brunel, Audrey Chen, Lou Cohen, Adriana de los Santos, Glynis Lomon, Dave Bryant, Emilie Mouchous, Gustavo Aguilar, Mark Miller, Ava Mendoza, Borah Bergman, Davindar Singh, Zavoloka, Alexei Borisov, Angela Sawyer, Jack Wright, Bob Falesch, Ben Bennett, Mark Johnson, Mike Dailey, Jill Burton, Shayna Dulberger, Chris Welcome, Andrew Einsenberg, Bonnie Kane. She also tours outside the US and has been featured in Brazil, Poland, Germany, Russia, Lithuania, Latvia, Portugal, Hungary, Canada, Italy and Austria. She continues using Max as her main programming tool. The approach to programming and performance is highly intuitive. Occasionally, the combination of the performance situation, the often abrasive sounds, the irrational use of the voice and the inherent uncertainty of improvisations contributes to discoveries of unknown places in her mind. 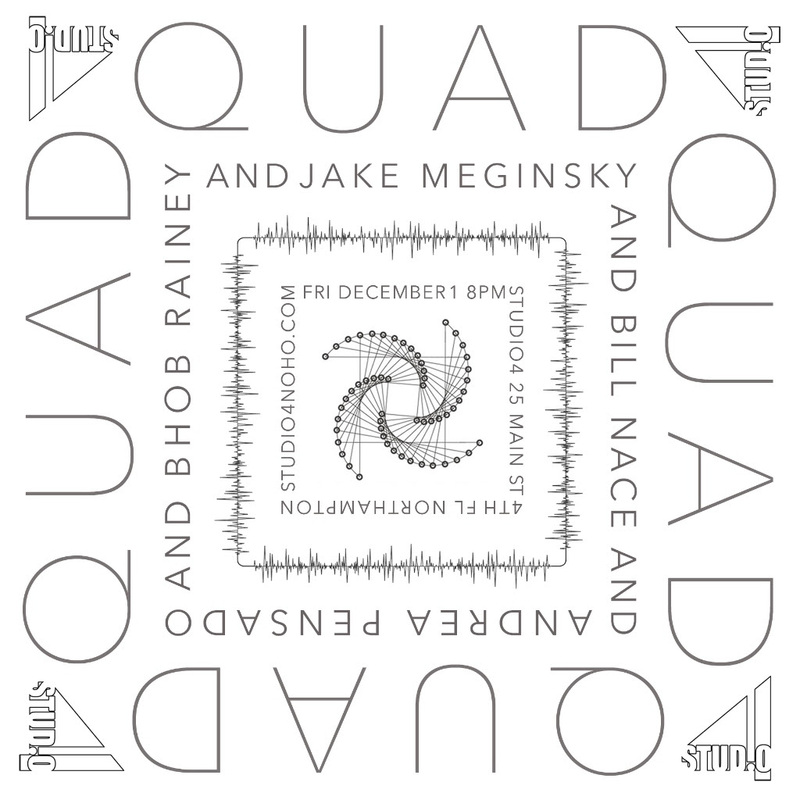 Bhob Rainey, a soprano saxophonist and composer, performs as a solo artist, as one half of nmperign (an improvisational duo with trumpeter Greg Kelley), and as leader of the BSC, an eight-member ensemble that uses both acoustic and electronic instruments. He formed the BSC to address the inherent challenge of performing longer works with multiple improvisational artists. "Improvisers have a tendency to try to make sense of their gestures too quickly, eclipsing opportunities for mystery, surprise, and a listener's engagement," Rainey says. "I help musicians suspend that sense-making while still remaining present and attentive to a piece's overall form." After 18 years spent living in Boston, with stints in Chicago and New Orleans, Rainey has returned to his hometown of Philadelphia. He holds an M.A. in jazz composition from the New England Conservatory of Music, and his music has been supported with grants from Meet the Composer and United States Artists. In 2014, the Philadelphia chapter of the American Composers Forum awarded Rainey a Subito grant for Axon Ladder, a collaborative multimedia performance installation with filmmaker and musician Catherine Pancake. His current interests lie in new realms of artistic possibility, from cross-disciplinary collaboration to digitally generated source material.